Learn With Legg. 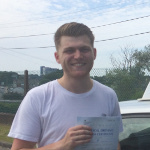 Driving Lessons in Truro, St Agnes and surrounding area with Chris Legg. I have taught many drivers over the years who have passed their test; the following are some words from just a few of them. I couldn't have passed my driving test without the help and guidance from Chris Legg. He made my lessons a fun yet professional environment each and every time I was in the car with him. Always pushing me to go further, which helped grow my confidence. I would highly recommend Chris to anybody wanting to learn to drive. Chris is a great guy and teacher, I enjoyed every hour learning and passed first time. I really enjoyed learning with Leggy. An excellent and thorough instructor which offers attention to detail in all aspects of the learning process. "Highly recommended"
All content © learnwithlegg.co.uk 2015-2016.